One of our most recent jobs was a volume order from a dual sport motorcycle club. We don’t focus our efforts on custom orders, but it is something we do from time to time – if the work finds us. Fortunately, I know the client and he was very flexible with what he wanted. He required the title and year to be shown on the front of the shirt and sponsors on the back – the rest was up to us. I like that. He said I could even use part of or a modified illustration of an existing Crock of Shirt design. I like that. I like that I like that. I began the process by scribbling down an idea or two. I also cruised the internet for pictures for reference. 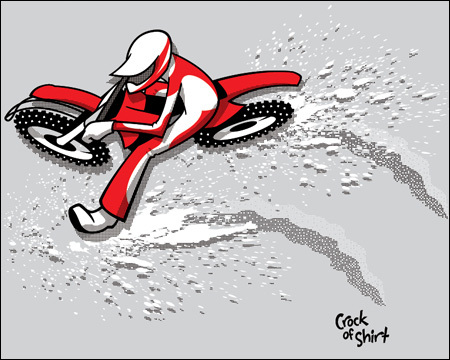 An initial suggestion early in the discussion phase was to use the mountain bike design and modify it to be a motorcycle. Initial thoughts were good, but I wanted something a bit different. After scouring the internet a bit more, an idea eventually popped into mind where I could do some graphical surgery on the ice racing artwork from last year. Side note: why change an existing drawing? Why not draw a new one? 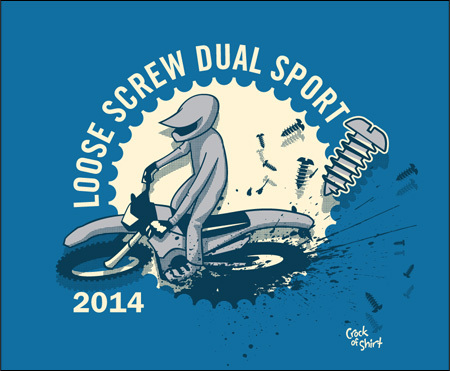 First of all, it takes me time to draw things – it’s not an immediate *plunk* and there’s a motorcycle. Secondly, what I was visualizing in my mind was similar to something I had already done. Work smarter, not harder, I always say! Step 1) Draw a sketch. Sketch a drawing. Whatever. I sketched something, printed it out, then traced over it with a pencil to highlight things and modify bits. That’s my thumb to the right. Step 2) Grab the artwork from the ice racing illustration. Set it above my trace layer. 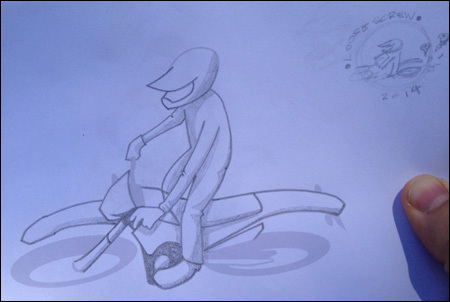 You can see the similarities in the helmet and bike parts that are in the sketch and the ice racer. Those are the pieces I’m after. Ah, what the hell – I’ll take the body of the guy, too. Step 3) Begin the usual red outlining to make things match up with my sketch. This is the surgical part where pieces are moved around, redrawn, deleted, and modified to fit. You can see where I took the body and brought the leg back and in. 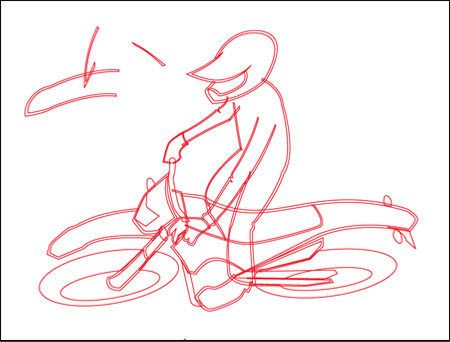 I also straightened the arms and front wheel of the bike for proper positioning. Step 4) Trouble. I’m not afraid or embarrassed to admit that I had some trouble with how to contain my ideas into one neat package. 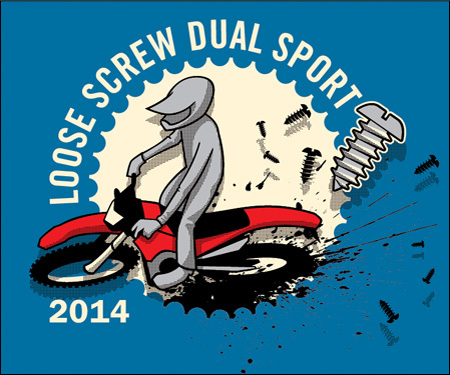 Some initial artwork was provided for me that included a chain sprocket graphic. I borrowed that idea and used it as the basic shape to contain the guts of the illustration. This kept everything unified. I think it was around this step that I started playing around with placement of mud splatter. The trick idea with this was to show the splatter as being screws that were being flung about. 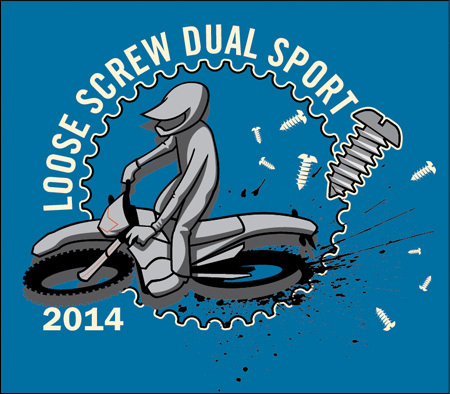 Loose screw. Get it? Step 5) Color can sometimes be a challenge to figure out. One thing to keep in mind when designing for shirts is that the color of the shirt can be used as a color in the design. In fact, I’d recommend it. The primary reason is it’s one less screen to be made, which can save time or offer more options. Depends on how you look at it. Step 6) Next to add to the mix is a bit of shading. This helps make the bike/rider pop out a bit. Some dimensional spiciness makes things more exciting. Actually, now that I look at it, I started blocking in shading in Step 4. Crap. Hmm, now my order of things is screwy. Well, you can see how I added the shading under the screws, rider, and front wheel of the bike from Step 4 through Step 6. It was also during Step 6 that I chose to do more of a monochromatic scheme. My primary reason was neutrality. I didn’t want to piss off guys who have red green bikes by making it a red bike. Then the red bike guys feel awesome and make fun of the guys with the green or yellow bikes. Then there’s a fight. We don’t want a fight. When the shirts were delivered, our client was very happy. That made us happy. We want to be happy. The funny thing is because I (Kurt) suddenly had to leave town for work, I never did get a chance to see the finished shirts! Kris handled the final delivery and took care of wrapping this one up. I’m hoping I can see one somewhere! Wear a shirt that you love! Crock of Shirt was born to share our passion for drawing and printing quality shirt designs. .
You should have printed a sample for yourself!